American University in Cairo Press, 9789774164521, 132pp. A vibrant novel of memorable characters who search for happiness and true love, cope with the bitterness that results from love's betrayal, and embrace new beginnings. Set in Cairo in the aftermath of the Six-Day War of 1967, Love in the Rain introduces us to an assortment of characters who, each in his or her own way, experience the effects of this calamitous event. The war and its casualties, as well as people's foibles and the tragedies they create for themselves, raise existential questions that cannot easily be answered. In a frank, sensitive treatment of everything from patriotism to prostitution, homosexuality and lesbianism, Love in the Rain presents a struggle between "old" and "new" in the realm of moral values that leaves the future in doubt. 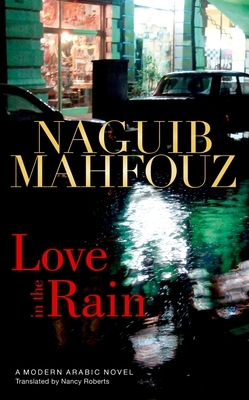 Through the dilemmas and heartbreaks faced by his protagonists, Mahfouz exposes the hypocrisy of those who condemn any breach of sexual morality while turning a blind eye to violence, corruption, and oppression, double standards as applied to men's and women's sexuality, and the folly of an exclusive focus on sexual morals without reference to other aspects of human character. Naguib Mahfouz(1911-2006) was born in the crowded Cairo district of Gamaliya. He wrote nearly 40 novel-length works, plus hundreds of short stories and numerous screenplays. He was awarded the Nobel prize for literature in 1988. Nancy Roberts (trans.) is the translator of Mohamed El-Bisatie's Over the Bridge (AUC Press, 2006) and Salwa Bakr's The Man from Bashmour (AUC Press, 2007) for which she received a commendation in the Saif Ghobash Banipal Prize for Translation.